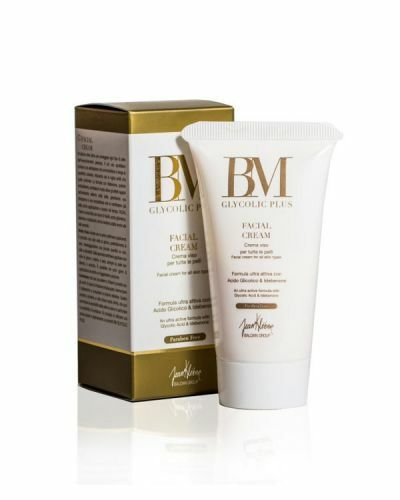 This BM Glycolic Plus facial cream is an ultra-active emulsion to protect any skin from premature ageing, the daily use produces a gentle exfoliation that softens and smoothes the skin surface, reducing both thin and deep wrinkles. The formula with powerful antioxidant Ubiquinone prevents actively the negative effects on the skin caused by the outside enviroment, also ensuring a hydration and compactness that occur from the first application and last over time. The facial cream is enriched with Karite butter, glycrrhetic acid, allantoin and bisabolol, which makes it suitable even for sensitive skin. Begin by applying the product the first week 1 only once a day, preferably at night, massage a small amount on the face, neck and decollete. From the second week apply twice a day morning and night, always on clean dry skin. It is possible in the early days of application - a little itching.